The science behind saltwater aquariums and what it takes to make them run successfully for any length of time has come a long, long ways over the past fifty years. If you are old enough and have been in the aquarium hobby long enough, you might remember when the Under Gravel Filter was considered to be the "state of the art" in aquarium filtration. The UGF filters were among of the first multi-purpose (mechanical to trap uneaten food and detritus, and biological to process ammonia) filters used in hobby aquariums. The first self contained aquarium canister filters, such as the Magnum 350 canisters were fairly simple devices which initially accomplished only one task such as mechanical filtration using a 10 micron pleated cartridge filter. The Magnum 350 had a pump built into the removable base and the entire unit could be used as a hang-on or free-standing. We used these filters in the early '90's with great success for cleaning our multiple 55g glass holding tanks in our tropical fish collection business in HI. The Magnums worked great for polishing the tank water after we stirred up the substrate on the UGF's (yeah it was that far back) until were built our 3,500g holding system using a wet/dry filter system with pelletized carbon for the biological filter. The Magnum 350's were improved over time to include different materials to insert into the center of the filter cartridges to expand the filter's functions. Their ease of use (the cartridges were easy to replace) and efficiency (took a lot of crud out of the water fairly quickly) made them a hit with us. Since the invent of the Magnum 350 there have been a number of other canister filters which have come on the market. For the most part the demand for this type of filter has come from the saltwater aquarium hobby. Saltwater aquariums require more and different types of filtration than do freshwater aquariums so filtration systems which can handle multiple and interchangeable filter materials in a single, fairly compact filter unit became quite popular and were soon produced by a number of aquarium equipment manufacturers. Many saltwater aquarists use a canister filter as an addition to their main filtration system, such as a sump based wet/dry filter or even a hang-on-tank filter. A majority of canister filters used with aquariums consist of a series of 2 or more stacked trays or containers through which water from the aquarium is pumped and then returned to the aquarium. Most canister filters include an internal pump but a few (i.e. the Red Sea Ocean Clear Canister Filter) use an external pump to push water through trays in the canister. Some of the canister filters, such as the Fluval 405, run the water through a mechanical filter as its first stage. These mechanical filters usually consist of a foam pad which can be easily extracted , rinsed and then place back in the filter. Other canisters leave it up to the user where to locate the mechanical filter in the tray stack. A foam pad can be used in these, or something as easy to use and inexpensive as polyester filter floss which ca simply be thrown away and replaced when it becomes saturated with contaminants. The number and types of chemical filtration products which can be used in canister filters is quite amazing. Most canister filters can use almost any of the products which come in a pad or bag form such as Phosguard which comes in a granulated form and can be inserted into a filter bag and placed in a canister tray or the Poly-Filter Pad which can be placed directly into one of the trays. These products are very effective for removing phosphates and silicates which are the main food for Brown Diatom Algae, which periodically appears in saltwater aquariums, especially right after a tank has completed the biological cycle. Most aquarists use at least one of the trays in their canister filters for their biological filter platform. The trays make it easy to install your preferred Biological Filter Material in the canister and to later remove and rinse debris from the material before using it again. 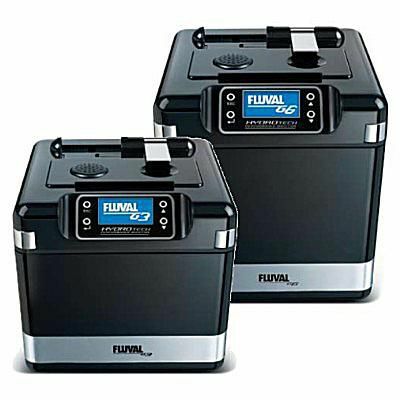 .For smaller aquariums there are smaller canister filter like the 3 stage Rapids Mini Canister Filter which offer many of the features of the larger, more expensive canisters. Which Biological Filter System Is Best For Yout Tank?